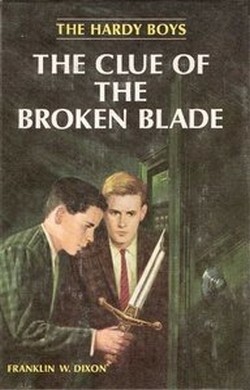 bayport beatWelcome to the April edition of The Hardy Boys News with a look at upcoming releases and the book of the month, “The Clue Of The Broken Blade”. 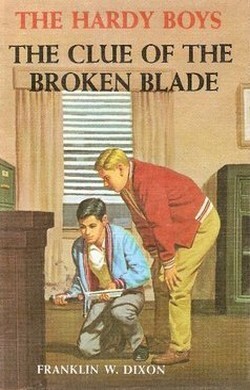 Detective brothers Frank and Joe investigate a crime of smashin’ in the tenth book in the interactive Hardy Boys Clue Book series. Frank, Joe, and their best friend Chet are attending Bayport Zoo’s annual Halloween carnival. 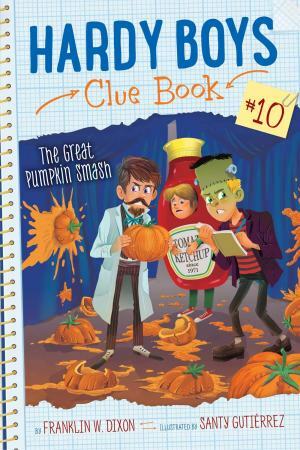 Frank and Joe have a routine planned for Scaryoke, and Chet has entered the pumpkin pie-eating contest-he even brought his own whipped cream! After their performance, Frank and Joe go to check out the painted pumpkins on display. But when the brothers enter the tent, they see their Scaryoke song wasn’t the only smash hit at the carnival. The floor is littered with bits of pulverized pumpkins! What’s worse, the organizer says that unless the culprits are caught by the end of the day, this will be the last Boo at the Zoo.forever! Can Frank and Joe find out what happened before it’s too late? Or is this pumpkin crime unpatchable? Frank and Joe have been hanging out at Sir Robert’s Comic Kingdom, the local comic and gaming shop, and got the exclusive invite to this year’s Halloween costume ball at Bayport’s one and only castle. Sir Robert plans to use the big event to unveil his most prized possession, a super rare comic that is rumored to contain a map to buried treasure. Sir Robert agrees to show his store regulars-who now include Frank and Joe-a sneak preview of the comic before the party. But when he goes to unlock the fireproof casing, he finds the book is gone. It will take all of Frank and Joe’s recently acquired LARPing skills to solve this case. Anything can happen in a castle full of dungeons and deception. Can the Hardy boys keep up? Eating candy nonstop and watching TV all day sounds great . . . until you actually do it, as the kids of Bayport High find out when all the adults vanish, and the world’s greatest (high school) detectives–the Hardy Boys and Nancy Drew!–have to team up to solve the mystery! Whether it’s going under cover, sneaking out at night, chasing weird buses, or following a strange smell, they know it’ll take all their wits and smarts to get their parents and teachers back . . . that is, if Joe and Frank don’t kill each other first. Oh, and there’s also the matter of the skeleton that can walk. And a major feud with a rival high school. And a koala-in-a-diaper costume. And lawlessness in the hallways. And an unrequited crush . . . 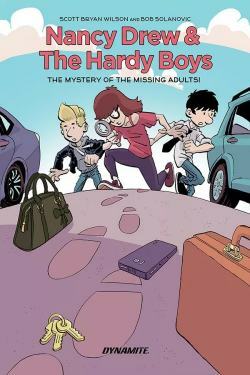 Written by Scott Bryan Wilson (Batman Annual, Star Trek: Waypoint) and drawn by Bob Solanovicz (Mister Meow), NANCY DREW AND THE HARDY BOYS: THE MYSTERY OF THE MISSING ADULTS! is a high-octane, nonstop comedic romp full of action, excitement, mystery, and friendship. And mayhem. Lots of mayhem. While researching the Hardy Boys in the Stratemeyer Syndicate archives of the NY Public Library, I came across some interesting documents which illustrated the process by which Hardy Boys titles (and presumably plots) were selected. After the initial list of titles proposed by Edward Stratemeyer, every year several titles were proposed. I suppose that Ed and the staff at the Syndicate sat around and hashed them over before selecting the title(s) for the coming year. I assume that until his death in May 1930, the titles were approved by Edward Stratemeyer himself. Many of the other titles are mundane but some are tantalizing. What could we have expected of 1930’s The Disappearance Of Fenton Hardy – another House On The Cliff perhaps? Of course, steady readers know that a disappearing Fenton Hardy is not exactly unusual in the series. From the original 1927 House On The Cliff to Spiral Bridge in 1966, Fenton had the knack of disappearing at the drop of a hat! In fact, one would be hard-pressed to name a book in which Fenton isn’t missing at least part of the time. 1932’s The Mystery Of The Bayport Lights sounds intriguing, especially with all the current reports of mysterious lights over the NJ Turnpike and other places! In fact, all the 1932 title proposals are rather unusual. Several titles were proposed in multiple years. Additionally, some titles had handwritten corrections/suggestions added to them or words crossed out. All such permutations are listed separately. Notes: Pre-1987 PC editions with blank endpapers are scarce. 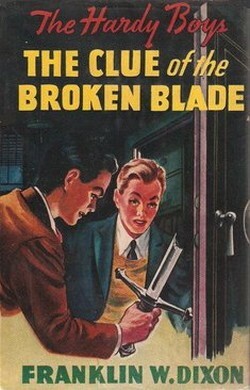 The Hardy Boys break up a truck hijacking ring and solve the mystery of the theft of Arthur Barker’s swords. 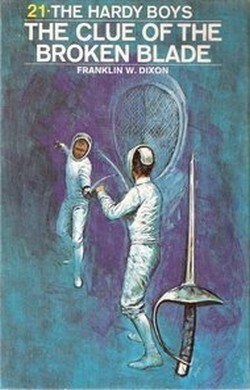 Description of current edition: Frank and Joe Hardy become involved in an intriguing mystery which revolves around their fencing master, Ettore Russo. Proof that Russo is the rightful heir to his grandfather’s estate hinges on retrieving the guard end of a broken saber lost many years ago in California. 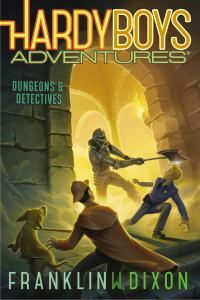 The young investigators’ quest is complicated by a bank robbery during which some of their father’s important records are stolen. 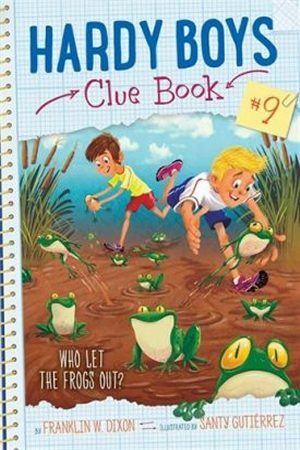 A chase ensues in the grape-growing region of California as the boys engage in a dangerous game of hide-and-seek with the bank robbery gang. And my Series Book Forum to discuss your favorite series.